story by julie lorchWissahickon Neighbors Park has a history of redevelopment. Situated on the corner of Terrace and Hermit Streets in Manayunk, the park is built on the site of a church that burned down in 1971. Following the fire, the city bought the land and built the park in 1976. 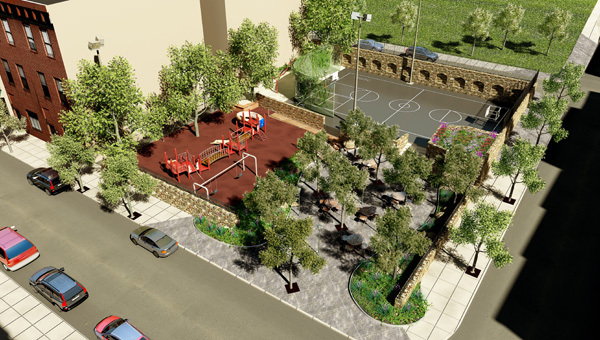 As one of the first small neighborhood playgrounds in the city, Wissahickon Neighbors Park was originally considered to be a highly innovative use of space. But since its construction and major renovations in 1994, the park has been largely untouched. The Wissahickon Neighbors Civic Association (WNCA), which was already taking small actions to restore the park, enlisted the help of the Collaborative to create a unified vision for the park’s master plan for revitalization. The redesign, done by Danielle Denk, the Collaborative’s volunteer architect from Dendridic Design, drew on the same innovative use-of-space idea utilized by the original park. Another critical feature of the redesign includes taking down the stone wall around the park to create a more inviting entrance to a “neighborhood porch” for public gathering. Other elements of the proposal will foster intergenerational use of the park, including chess tables, a climbing wall, sprinkler area and sand bed. The basketball court will stay, but will get lines for a four-square court and hopscotch. WNCA hopes these renovations will help entice more family-oriented renters and first-time homeowners into making the Wissahickon neighborhood their permanent community. The master plan inched closer to reality in 2010, when Craig Ablin, leader of the WNCA’s park revitalization committee, shared the Collaborative’s proposal and renderings with Councilman Curtis Jones’ office. That May, Jones’ office announced the park would receive $200,000 to begin implementing Phase 1 of the master plan, which includes the new entryway, the “neighborhood porch,” and the rain garden. With this funding, WNCA hopes to begin the renovation project shortly.